Naturally caffeine free. 4 calories per cup. Sugar free.All natural ingredients* * All our herbs are gently steamed, the process in gentle to protect their delicate taste. The bright, deep colours of this infusion are like the warm sunset with its reds, crimsons and golds, setting over a postcard-perfect view. What does it taste like? 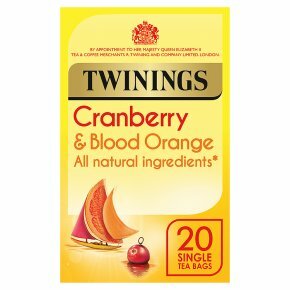 The zingy sharp notes of cranberries balance the sweetness of oranges which bring some smooth, exotic sunshine that beams from your cup.